When planning for military engagements in the next two to four decades our Defense planners will have to examine what can be learned from demographics. The following analysis was prepared for the April 2016 issue of the AFCEA Signal magazine. Conditions now projected for thirty years ahead, or year 2045, will originate from current decisions. Defense plans will have to address the lengthened life of ships, aircraft and combat equipment. Personnel now entering into military service will be retiring in thirty years. The environment in which U.S. Defenses will operate will also have to anticipate how to cope with a different composition in the global population. It is the purpose of this Viewpoint to outline what are some of the current indicators that will be shaping our approach to dealing with situations in the different countries. This Viewpoint is based on an analysis of the data from 180 countries that is now available from the World Bank. Demographic analysis will have to start with an examination of population growth and of its wealth. 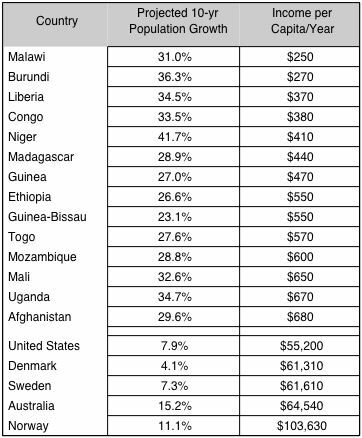 The following table shows that the largest projected population increases will originate mostly from newly created post-colonial African countries. We find that population growth rates ranging from 23% to 42% are likely to be taking place under conditions of social turmoil, especially if the per capita income levels remain at the $250 to $680 subsistence levels. Though the aspiration levels may rise as influenced through accessible media, hopes of lifting from abject poverty could be potentially influenced by propaganda from ideologically radical sources. An analyst’s examination of the population growth patterns will also take into account whether there will be young people ready to foment conditions for potential military exploits. This youth, representing between 35-47% of the total population, will try to enter into labor force where there will be few available employment opportunities. Although this group does not have sufficient education they are becoming more literate by listening to media and will demand the privileges of the more wealthy countries as an entitlement. 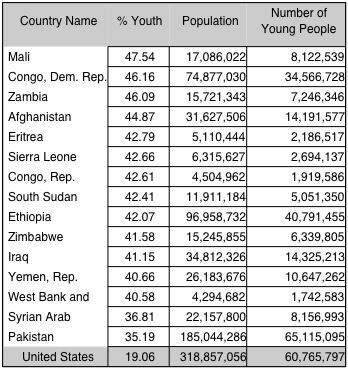 The above table will show that in a number of countries, currently affected by disturbances, there is large share of the total population now aged up to 14 years. They will age into a new generation that could be guided by preachers and politicians to become “angry young people” who will be clamoring for what is not available to them. Instead, they could be goaded to what is increasingly becoming an accepted political norm that they “are created endowed with the rights for life, liberty and the pursuit of happiness”. But changes in the population numbers will not be sufficient as indicators of potential political conflicts. It will take other influences to create conditions that are favorable to the initiation of asymmetric warfare actions. We have examined income per capita and the age for a wide range of countries where conditions of stability have not been as yet established. It is apparent that even small nations can well afford the acquisition of readily available arms as well as off-the-shelf command control systems to engage in military actions. Warfare used to required large-scale deployments of forces to engage in an armed conflict. That is no longer necessary. Easy availability of weapons in the hands of even a small, untrained and impoverished organization has increased the number of incidents that will appear as military actions. The number of small war-like incidents is likely to be increasing, not decreasing. As is the case for using any explosive, it cannot be activated unless there is also an ignition trigger. Though demographic conditions need to be favorable it requires a spark to create organized violence. It takes the calls for political actions that transform events out of the domain of demographics into matters that can be dealt only with ideology and politics. CONCLUSION: Our analysis highlights that a large growth in impoverished and unemployed youth are likely to be setting up the conditions for increased disturbances. There is no shortage of revolutionary leaders who are ready to exploit activities that can be dealt with only by an organized military.